Ringbone is a bony enlargement on the surface of the horse's pastern bone and is usually a progressive, degenerative disease. Ringbone occurs as a result of the production of new bone on the surfaces of affected bones, which is known as exostosis, meaning new bone formation. Ringbone is caused by periostitis of the proximal or middle phalanx or from osteoarthritis (OA). Ringbone is further classified based on the location of the bony changes. 'High ringbone' involves the pastern joint (the lower part of the first pastern bone and/or the upper part of the second pasture bone). 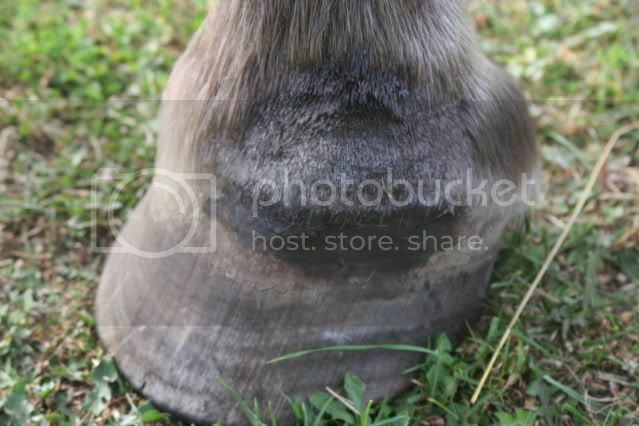 'Low ringbone' involves the coffin joint (the lower part of the second pastern bone and/or the top of the pedal bone). 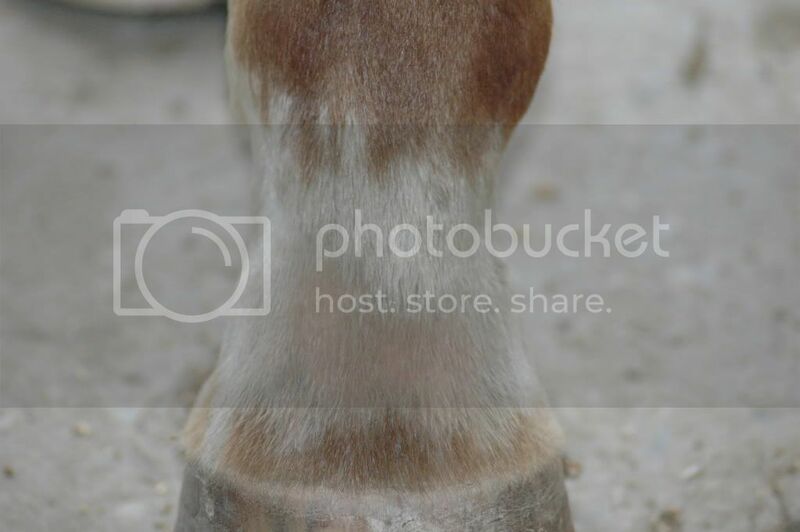 When 'Low ringbone' is severe, it can sometimes cause an obvious bony swelling at the horse's coronet which is sometimes referred to as 'pyramidial disease' or 'buttress foot'. Another important distinction regarding ringbone is whether it is articular (involving a joint) or, more rarely, non-articular (does not involve a joint) in nature. When ringbone involves a joint (articular), is it more likely to cause lameness than ringbone that does not involve a joint (non-articular). Phalangeal periostitis: Ringbone caused by periostitis of the proximal or middle phalanx occurs as a result of trauma from lacerations of brushing, extensor tendon strain, or from chronic microtrauma to the connective tissues due to poor conformation (especially horses with long sloping pasterns, very upright pasterns, long toe-heel foot shape, unbalanced feet, base-narrow, base-wide, toed-in ('pigeon-toed') or toed-out ('splay-footed') stance). If ringbone is caused by a soft-tissue strain, lameness is usually only present during the acute stage, however if it involves the common digital extensor tendon, persistent lameness often results. High ringbone Ringbone that is usually associated with an insidious onset and chronic, non-specific lameness. Athletic horses that are asked to regularly perform sudden stops and tight turns are more prone to this injury. It is less frequently the secondary result of fractures, OCD, or penetrating wounds of the foot. Low ringbone:Horses may show no outward signs of bony changes (radiography is needed to confirm) but will present with moderate lameness (grade 2 to 3, out of 5 with 5 being the most severe). Most horses with low ringbone have some degree of lameness, due to the close proximity to the coffin joint and its supporting structures. Radiography - Diagnosis of ringbone is through radiography and is important for verifying whether the associated bony changes involve a joint or not, as treatment and prognosis are dependent on this findings. Slowing the progression of the disease by reducing or controlling the contributing factors to its development Achieved through correction of unbalanced foot conformation through corrective shoeing methods, performed by an experienced farrier. Farriers will need to balance the horse's feet and provide complete support to the heel. For severe cases surgery may be needed. Between 65-85% of horses that are surgically treated through surgical arthrodesis return to full athletic function. The prognosis depends on the location of the ringbone and whether a joint is involved. Athletic horses that regularly perform sudden stops and/or tight turns.